Theodora Lau is as up-and-coming as it can get. The Ngee Ann Poly mass communications student is part of the Baybeats Budding Bands Programme, and she’s just getting started. This year, the local singer brings her haunting voice to the simmering pot of rojak that is the local music scene. As part of the lineup for Baybeats Festival 2015, Theodora will play the scenic Arena stage – more commonly known as the Esplanade Outdoor Theatre. Firstly, who are your musical influences e.g. who would you queue overnight at SISTIC for? I actually wouldn’t queue overnight at SISTIC because I love sleep too much for that, haha. I think close to everything I’ve encountered has influenced my music. I mean, I’ve artists like Lianne La Havas, Andrew Belle and Ólafur Arnalds in my playlist but it’s not just musicians, albums or songs. It’s the experiences I’ve had, the books I’ve read and the people I’ve met. I think all of this has left some sort of impact on me, inevitably influencing the music I create. How would you describe your sound? Are you fussy about genre labels being given to your music? I haven’t found a way to describe my sound yet. How has Noise Singapore’s Music Mentorship programme enabled you as an artist? The Music Mentorship Programme really acted as a launching pad for me. It was a great platform to help get my music out there. How do you feel about being the only solo artist among the Baybeats Budding Bands lineup? It’s exciting! I’m glad to have been part of this Budding Bands Programme and I’ve learned so much from (mentor) Errol (Tan). I’m really looking forward to Baybeats. Any news you can share about a possible album release in the near future? Yes! I’m actually releasing my first single on 25 June 2015 and my debut EP at the end of 2015. How would you encourage young singaporeans to #supportlocal? I’d encourage us to keep an open mind. There’s so much local talent to be proud of and I think there’s something invaluable about the art created by individuals from your social fabric/community. Lastly, what is one Singaporean dish you just can’t live without? 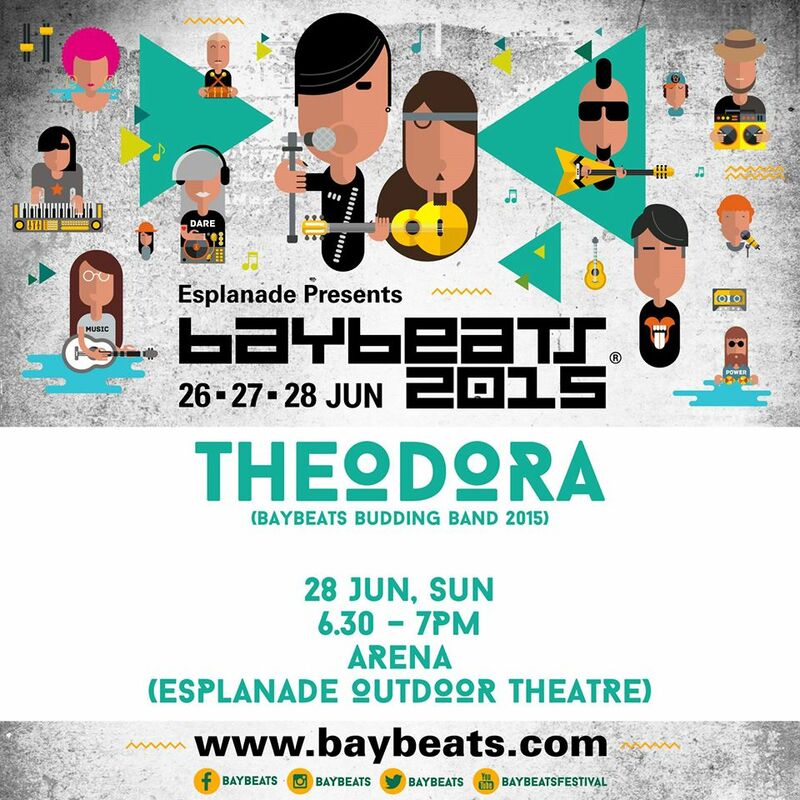 Catch Theodora at the Arena Stage (Esplanade Outdoor Theatre) on Day 3 of Baybeats – Sunday, 28th June 2015 @ 6:30PM!